Last week I featured the books that I was actively looking for. 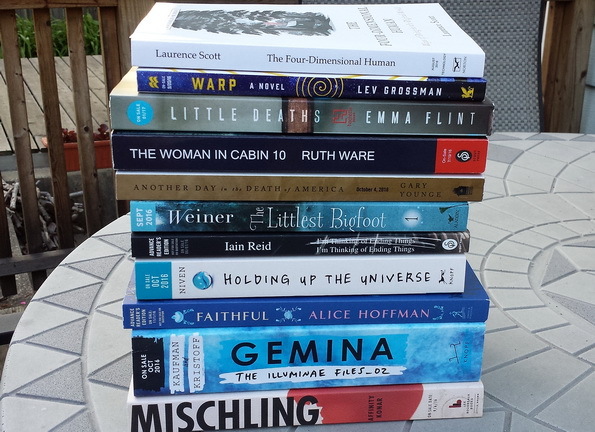 Today I’m featuring some of the books that I newly discovered while visiting the booths at BEA. A highly original and pioneering portrait of life in a digital landscape. This re-publication of Lev Grossman’s debut novel, Warp, shows the roots of his Magicians hero Quentin Coldwater in a book that is for anyone (and everyone) who has ever felt adrift in their own life. This powerful and moving work puts a human face—a child’s face—on the “collateral damage” of gun violence at a time when the gun issue in America is being hotly debated. A laugh-out-loud funny and painstakingly real tale of friendship, furry creatures, and finding the place where you belong. A heart-wrenching story about what it means to see someone—and love someone—for who they truly are. A soul-searching story about a young woman struggling to redefine herself and the power of love, family, and fate. One of the most harrowing, powerful, and imaginative books of the year” (Anthony Doerr) about twin sisters fighting to survive the evils of World War II. I didn’t get a copy of Another Day at BEA, but I’m going to look for it now. Thanks for sharing your books, Leslie. Faithful is one I’d be interested in checking out. I do get some great suggestions from your book lists. Thanks! I’m drooling as I look at everyone’s BEA stacks. It looks like you picked up some great books! Great mix of books. Hope you had a blast at BEA! Wow! That is quite a hefty stack. Enjoy your new goodies, Leslie.